Ticketing law-breaking bicyclists: if Edina and NYC can do it, why can’t Northfield? It bugs me when I see bicyclists A) zooming through Northfield-area stop signs in high traffic areas; B) riding on the wrong side of the street; and C) riding on sidewalks downtown. These behaviors both scare drivers and create animosity towards bicycling… and make it less likely that "share the road" efforts will gain broad public support. If there is one thing that unites New Yorkers who see bikes as a menace with others who view them as a mainstream form of urban transportation, it is a mutual distain for the lawbreaking cyclist. I witnessed some close calls while visiting NYC last week, including one incident when a cyclist blasted through a red light and almost hit a pedestrian who then screamed profanities at him. Over the past year, the Police Department has received many complaints about bicyclists’ riding behavior in Edina. The primary complaint is that they are not stopping at stop signs and are dangerously weaving in and out of traffic. I have seen this first hand and have become very concerned for their safety and for the consequences of their dangerous travels… I have instructed my officers to begin ticketing bicycle riders that blatantly violate common traffic laws, just as we do with drivers of motor vehicles. This is considered a moving violation and will cost riders about $144. Does the Northfield Police Department ticket law-breaking bicyclists? I doubt it. I’ve never seen it happen. But it’s time to start. Griff…Soon you will get what you want. Tickets for cycling on sidewalks even if it is the safest alternative for the cyclist and pedestrian alike. Tickets for slowing, but not stopping, at a stop sign, even though the cyclist has yielded to other (if any) traffic. Tickets for this and tickets for that. Should we ticket cyclist who ride on the grass in a public park since it probably bothers some other folks using the park? How about a ticket for riding where there is no sharrow or marked lane? Some would say that is ultimate goal of those proposing street markings. I’m not sure if cycling is really promoted by all the control methods you support. It just turns recreation into transportation. I believe that all of this boils down to common sense and how much a person values their life…. 1) For a number of years, Northfield has ticketed skateboarders for riding on the sidewalks (due to near-misses with foot-traffic); couldn’t the same injuries (or worse) occur with a bicyclist colliding with a pedestrian on the sidewalk? 2) In reference to your statement, below of “When I’m lugging my groceries home on my bike in the rain, I need to make a complete stop at a empty intersection or risk a $144 ticket that might be reported to my insurance company?” My thought here…. Would you rather risk a $144. ticket or your life? What if automobiles decided that the street signs didn’t apply to them? The signs are on the streets because they apply to everyone using the streets, be it on foot or on wheels. We are adults; let’s make adult-like choices. We ALL have a responsibility to share the road! I think it’s key to educate these people first. Many people ride on the sidewalks because they are afraid of drivers. As someone who was hit by a car while riding a bike legally, I can tell you, it is hard to tell yourself the road is safe. Also, many people ride on the wrong side because they don’t realize they are considered a vehicle. NFLD used to do bike safety courses when I was a kid. They would teach us the motions for turning, stopping, how to put on a helmet right, and how to safely ride on the streets. Encourage educating people before you start ticketing. Tickets without first letting people know the laws will only aggravate the citizens of Northfield. I have seen instances where the NPD has cited cyclists for running stop signs. Britt, I know that they stop/warn bicyclists but do you know for sure that they actually issue citations? How do you view bicycling on sidewalks as a safe alternative for pedestrians? As one who has worked downtown Northfield for over 25 years, I cannot count the number of times I have walked out of a store or business and had a close encounter with a bicyclist or skateboarder. Neither has a place on sidewalks. There is a reason the trails around Minneapolis lakes have separate lanes for walkers/runners and wheeled exercisers. As far as bicyclists rolling through stop signs, I can understand their motivation, and can accept the practice to a point, but abuse is prevalent and the law should be enforced. Rick…I agree that something should be done to stop cyclists from using sidewalks downtown and am not opposed to tickets. But unless the ordinance is very specific, ticketing there will lead to ticketing on sidewalks where cycling is a safe and/or more pleasant alternative to the street. In some cases cyclists should, in fact, be encouraged to use sidewalks, not discouraged. Some trails have separate lanes some do not. Trails that have no lanes are shared by cyclists and walkers everyday. It is also possible for sidewalks to be used the same way. Jefferson parkway is a nightmare for cyclists uncomfortable with ‘taking the lane’. Virtually unused sidewalks along side that street are the safe alternative for many cyclists. It’s the common sense choice. (I expect some would say the solution is to widen Jefferson parkway to allow for bike lanes…I don’t think this makes sense. Save the money and the grass, take the lane or use the sidewalk). Rolling through a stop sign is not ‘abuse’ if the cyclist has correctly given the right of way to other vehicles. Such a ‘roll through’ abuses no one except the sensibilities of those wishing to extend more control measures over cyclists. I’d say it is an abuse of cycling to make a rider stop when there is no reason to do so. Let’s face it some folks just don’t like the free wheeling nature of cycling. Others think that it is necessary for a bike to act like a car in order for a car to respect a bike. But bikes are not cars. They are motorless vehicles capable of using many surfaces. Forcing bikes to act like cars will not increase the use of bikes. Agreed, Rick…. as I’m strolling my Mother (in her wheel-chair) downtown, the last thing I want to be worrying about is a bicycle slamming into us. Skateboarders & bicycles, both – belong on the streets; skateboarders are ticketed – why not bicyclists? “Griff, This is an area as a department we have discussed several times. Although we take enforcement/education of bicycle laws and bicycle safety very seriously, I echo your concerns. I have seen, as well as my officers, pretty unsafe and even illegal bicycling out there. I would like the Northfield Police Department to concentrate more in this area. Is this a good result Griff? When I’m lugging my groceries home on my bike in the rain, I need to make a complete stop at a empty intersection or risk a $144 ticket that might be reported to my insurance company? Or will it just be the flagrant violators that get the ticket? I guess we should trust the police to use discretion and common sense since we can’t trust the citizens to do so. Such is progress in the nanny state. Can explain why you feel it is acceptable for cyclists to NOT make a complete stop at a stop sign. When it is raining and I am lugging my groceries home in the back of my pickup do you feel I should be able to roll through the stop signs as well? It seems to me that you and many other cyclists feel the laws only partially pertain to them. In order for motorized vehicles and cyclists to make a go of sharing the road then we all need to obey the rules of the road. Do you have to turn off your truck and get half way out when you completely stop at a stop sign? Do you have to give the truck an extra push with your legs to get it going again? A cyclist has to give up the momentum he has, stop, take one foot off the vehicle in order to not fall over, get back on, and then exert considerable effort to overcome the inertia of the bike and his body in order to get going again. Are you inconvenienced in any way by stopping your truck and then pushing the gas pedal? William, it’s highly unlikely that bicyclists will be ticketed for slow rolling through a stop sign. I do it all the time on a bike. It’s the bicyclists who blast through stop signs when other cars are stopped at or approaching the intersection that’s the problem. I’m curious, tho. What does this issue have to do with the “nanny state”? I don’t want to be hit by a bicyclist when I’m walking on the sidewalk and I don’t want to kill a bicyclist, especially a kid, who runs a stop sign or rides their bike on the wrong side of the street. The vast majority of cyclers act responsibly. They use judgment and common sense to protect their own safety and the safety of others. They also understand the nature of their vehicle so at times they may coast through stop signs. Coasting through a stop sign is illegal. You asked the police for enforcement of the laws and now we are going to get just that. The police chief will assign an officer…ASSIGN AN OFFICER…to focus on ‘illegal biking out there’. Since you believe it is ‘highly unlikely’ that cyclers will be ticketed for this illegal activity, perhaps you could get the chief to say so. I guess I used the term ‘nanny state’ as a reference to peoples’ willingness to give up their ability, (and other folks’ ability) to use judgment and common sense in favor of law and enforcement entities to do it for them. I wonder how long before the overly cautious invoke the nanny state to ban bikes from all sidewalks in town. After all, something bad might happen. William, as you well know, “if it saves just one life, it’s worth it.” As it happens, I agree with your thoughts about this. I must admit, however, it seems a bit incongruous for you to worry about the ‘nanny state’ now after mocking on this blog my concerns about the augmentation of discretionary police powers vis a vis the primary seat belt law some years back. I don’t remember what I said yesterday, let alone ‘some years ago’…Anyway I guess we all have evolving political opinions. Please be glad we are now in agreement. William, most people seem to know that driving a car 5 MPH over the limit in MN is not going to get you stopped, even though it’s still breaking the law. But you’re not likely to see a public statement by law enforcement leaders stating that their policy is to generally look the other way at this and instead focus on those going 10 MPH or more over the limit. I think the same is true with bike-related laws. NPD officers aren’t going to cite you and me for a slow roll through an intersection in a safe manner. Nor or they going to cite me when I hop my bike up on the sidewalk in front of the Blue Monday and coast 10 feet to the bike rack. They’re not going to make public pronouncements about the grey areas, but in practice, I think you can trust that they’re only going to cite people for reckless behavior that clearly endangers themselves or others. You are probably right about citations for rolling through a stop sign on a bike, and now that we’ll have an officer assigned to focus on this major problem of illegal biking, I guess we’ll find out for sure. I’ll still be rolling through, so will let you know. We arrest people for impaired driving because the potential for harm is so great. (An ounce of prevention and all that.) But with bikes, I just don’t think there’s the same potential for great harm. I ride my bike downtown to run errands once or twice a week. I am careful and defensive and respectful and even fearful of cars. I will ride through a stop sign IF I am 100% confident that there are no vehicles or cyclists or pedestrians anywhere near my path. I am causing no harm to anyone. If somebody on a bike mows down a pedestrian on a sidewalk, the biker should be cited. Otherwise, leave him or her alone. Jim, you seem to be saying that bikers should only be cited AFTER they harm someone. Is that correct? Griff: Yes, that’s what I’m saying. Jim, public safety laws are created to prevent behavior that endangers the public. If I use a gun to shoot a raccoon in my yard (I live inside the city limits), I’m likely to get cited because the ordinance says this endangers the public. If I knew that I’d only get cited if I inadvertently hurt someone while trying to shoot pesky critters, I’d do a lot more shooting and many other guys would, too… raising the likelihood that pets and people would get shot accidentally. What principle guides you to say that you would you make an exception for reckless biking behavior that endangers the public? Jim, I find your comment that “bikers should only be cited AFTER they harm someone” to be one of the most insane statement on this feed……. What if there was no preventative measures for say – drunk drivers? First, we should be part of a potential fatality, and THEN, educate the driver about the risks involved, after the fact? Wow. Having, myself, 1) been in an accident as a bicyclist and lifted myself off the road to see my friend creamed on the highway, 2) been the first on the scene of a bicyclist fatality involving a family member and identifying the deceased as a member of our church, as well as 3) involved in a drunk-drunk driving accident (no, I’m not too proud to admit it)….. and I *learned* something from these experiences. I hope it not too late for you to see the light, as well, before you/others suffer clearly *avoidable* consequences. Charlene, I appreciate your weighing in here with your strong opinion but there’s no need to do it by labeling Jim’s position as ‘insane.’ Please take a quick look at the LoGro discussion guidelines. But most of the resentment of rule-breaking riders like me, I suspect, derives from a false analogy: conceiving of bicycles as akin to cars. In this view, bikes must be regulated like cars, and vilified when riders flout those regulations, as if we were cunningly getting away with something. But bikes are not cars. Cars drive three or four times as fast and weigh 200 times as much. Drive dangerously, you’re apt to injure others; ride dangerously, I’m apt to injure myself. I have skin in the game. And blood. And bones. Nor are cyclists pedestrians, of course (at least not while we’re pedaling). We are a third thing, a distinct mode of transportation, requiring different practices and different rules. This is understood in Amsterdam and Copenhagen, where nearly everyone of every age cycles. These cities treat bikes like bikes. Bicyclists who disregard basic safety rules are a huge problem in the Uptown area of Minneapolis. I’ve literally been knocked to the ground twice by cyclists riding on the sidewalk in the 31st St./Hennepin Ave. area, and have had too many close calls to count by cyclists blasting through stop signs and traffic signals. I’ve griped about it on Uptown-related Facebook pages, but I don’t think the Minneapolis police department is addressing the issues in any kind of meaningful or impactful way. I have to say, though, that when I posted on the Uptown Facebook pages I expected to get blasted by comments defending cyclist behavior – and was stunned to see that big numbers of my fellow Uptown-ers were in complete agreement with me – including those who use bicycles as their primary mode of transportation. I agree largely with NYT ethicist Randy Cohen (see #7) both as a matter of ethics and as a matter of practice — I often treat stop signs as, in effect, yield signs, especially when hard-won momentum seems at risk. And Cohen’s quite right, IMO, in arguing that bikes and cars are different enough that traffic laws should reflect these differences. Minnesota traffic law (I’ve spent a good 2 minutes researching it) apparently defines bicycles as “vehicles”, and hence subject to the same traffic rules as cars and trucks. One exception I noticed: bikes can (usually) park on sidewalks. But Cohen seems to me too quick to wrap himself in Kant’s flag of virtue. Running red lights, and maybe also stop signs, even when doing so endangers nobody, risks confusing pedestrians and drivers both about what’s legal and about what to expect from the cyclist in question. If I’m driving and notice a cyclist running red lights behind me, I’ll wonder what to expect when we both reach the next red light together. I’m glad Northfield police use discretion in enforcing traffic rules for bikes; else I might languish behind bars. But wouldn’t it be clearer and ethically better to amend rather than flout some traffic laws? Here’s a start. (i) Redefine stop signs as yield signs for non-motorized “vehicles”. (ii) Really enforce “yield” laws — threaten or run down a pedestrian and get clapped in irons. Good idea Paul. But it might make things way too complicated in a town where many drivers seem reluctant to exercise the right of way at stop signs. It’s a ‘niceness battle’ at the 4-way stop: “You go first”, “No, you go first” “I’m in no hurry, you go first”. And it’s really important to be nice to a cyclist, let’s see what he’s doing coming up to the intersection. So, nobody moves; cars or bike. I suppose this is a good problem for bikers, but it can make it hard to keep rolling. I don’t think that they fear running into me, they fear that I’ll run into them. It’s nice not to run into someone, but it’s really nice not to let someone run into you. 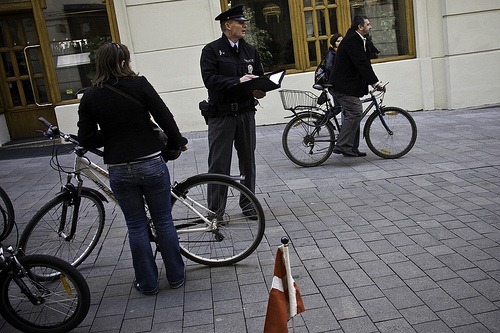 There are other things that make a bicycle different in terms of traffic law — in most circumstances, they may become pedestrians by riding on a sidewalk or in a crosswalk. In these circumstances, other traffic must treat them as pedestrians. So, for example, a bicycle riding across a marked crosswalk has right of way over vehicles on the road it crosses, even if that road has no stop or yield sign. And running red lights is sorta lawful. Minnesota has an “affirmative defense” for cyclists and motorcyclists who run red lights after making a complete stop and who “reasonably believe” that the light will not detect them. This means that, as long you have made a complete stop and are yielding to cross traffic, you may get a citation, but it could be easily dismissed in court. A less attractive distinction between bicycles and other vehicles as that they must ride “as far right as practicable”, with a slew of exceptions that basically boil down to: if the lane is so wide that a motor vehicle and a bicycle can safely use it side-by-side without the bicycle riding unsafely close to car doors, storm drains, etc, a bicycle must then ride far enough right to permit that sharing. So, in Northfield, you could not lawfully ride down the center of Roosevelt Drive (unless preparing for a lef turn). But you could (and should) lawfully ride in the center of the lane on a road like Jefferson Parkway, where it is not possible to safely pass a bicycle in-lane. Also note that riding “as far right as practicable” only applies to the driving lane. A bicycle is not required to ride on a shoulder or in a bike lane, and should not ever ride in a parking lane. Griff: you needn’t leave these things to wonder. I actually did a data request and map for this last year. In the five-year period 2005-2010, bicyclists were cited (not just warned) for riding on a sidewalk three times. Three cyclists were cited for running stop signs, two at the same intersection (5th and Water). Check out the map for yourself. There aren’t all that many citations, but — then again — there aren’t that many citations of drivers for unlawful behavior regarding bikes/pedestrians either. William: it should comfort you that no cyclists were ticketed for failure to make a “complete” stop at empty intersections. The citations all involve other traffic being cut off, and/or going through a stop sign at a very high speed. I think, in practice, law enforcement will tolerate ALL vehicles — bike or auto — going through stop signs at 5-7 mph, as long as nobody’s cut off. In any case, we definitely agree on this bike-related point: you should stop in such a manner so as to give yourself sufficient time to judge whether it is safe to proceed. That may be 5 or 10 mph. Or it may mean you have to put a foot down. It is entirely conditional, and saying that all stops must include a foot on the ground in order to be “complete” is unfairly punitive to cycling. Our goal right now is not necessarily ticket every bike violation we see, but for the violations that are blatant, such as completely “blowing” through a stop sign without even slowing down. Education is still very important. This is a sensible and fair approach, in my opinion. Less than 20 citations in five years? I think my exact request was “any citation involving a pedestrian or bicyclist,” regardless of whether a driver or ped/cyclist was ticketed. There were a few irrelevant ones that I filtered out, but everything else made it onto the map. I too find it a bit disappointing how few citations there are. Bikers like to point their finger at drivers as the reason for crashes, and drivers do the same to bikers. It turns out both are almost equally to blame. A new analysis of 10 years of crash data has found that drivers and cyclists are almost equally at fault in the 270 reported bike-motor vehicle crashes that Minneapolis averages annually.